Debuted at a Society of Motor Manufacturers and Traders event in the UK, the “Project P” concept—as it is called internally at Honda—was built by a team of product engineers at the UK Manufacturing plant in Swindon, England. I’d say this thing is actually closer to a ute than a pickup, and with its fairly small diamond plating-lined bed and its lack of a tailgate (a prerequisite for any pickup, if we’re honest), it doesn’t look all that practical. 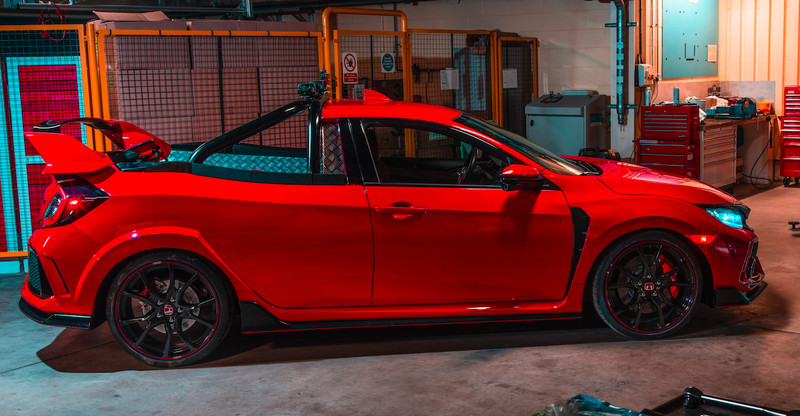 But the Civic Type R is all about being over-the-top madness, so I say there’s nothing wrong with letting engineers go nuts. Plus, a huge rear wing (which Honda says is movable for access to the bed) on a ute is just cool. Which is probably just as well, as I’m sure sawing away at that unibody didn’t do much for the Type R’s handling. And also, I’m not sure how well a high-horsepower front-drive sports car would deal with a bunch of weight in the rear. Especially on a hill-start. Still, I’d give it the green light for production.